What does it actually mean to be someone’s “brother”? Is it a purely genealogical notion, a biological distinction marked by nothing more than one’s parentage: the male offspring of your mother and father is your brother, nothing more or less? Is it a societal notion connected to a sense of deep kindred and mutual reliance: the soldiers that you live, train and die with are your “brothers,” regardless of whether you’re blood-related or not? Does biology always guarantee kinship, at some level, or do you have to actively work to achieve that kind of relationship? What about adopted siblings? Society tells you that your adopted brother is just as much kin as a blood relation, a bond which is doubtlessly reinforced by each and every family that welcomes adopted children into their homes. But is he? Can adopted siblings ever develop the deep-seated bonds of blood relations? Can someone ever truly and unconditionally embrace their adopted sibling, take them into their heart and call them “brother” with the complete and utter conviction of one that they actually share genetic material with? At the end of the day, what does it really mean to call someone “brother”? First-time writer/director J. Davis’ Manson Family Vacation (2015) takes a stab at this question via two brothers: straight-laced family man/contract lawyer, Nick (Jay Duplass) and his restless, nomadic, uber-hippy, adopted brother, Conrad (Linas Phillips). After Conrad suddenly pops back up in Nick’s life, while en route to a new job in Death Valley, the two brothers get a chance to reconnect and work on their often contentious relationship. At his wife’s urging, Nick swallows his own misgivings and attempts to reconnect with his estranged sibling. When Conrad’s obsession with Charles Manson and his cult leads to the brothers touring various “murder houses,” however, Nick finds it harder than ever to see eye-to-eye with his “weirdo” brother, especially since he’s now dealing with antisocial behavior from his own teen son, Max (Adam Chernick), and is worried that Conrad is going to provide the worst sort of role model possible. When he comes in to find Conrad gleefully showing Max his favorite grisly crime scene photos from Helter Skelter, it kinda seems like he may have a point. As the brothers check off “must-sees” on Conrad’s list, though, they find themselves settling into an uneasy balancing act that might, given time, actually blossom into something approaching “love,” if not quite “respect.” Nothing is ever quite as it seems, however, and a secret regarding Conrad’s real parents threatens to tear apart the brothers’ tentative relationship before it’s had a chance to fully heal. Will Nick and Conrad be able to put aside their differences and embrace one another or is it finally time for them to cut ties and burn all their old bridges to the ground? Despite a gloriously goofy presence and some delightfully comic setpieces (the scene where Nick and Conrad finagle their way into the old Labianca house, under very false pretenses, is a minor comic masterpiece, for one), there’s a big, dramatic heart that beats at the center of Manson Family Vacation and some genuine emotional resonance to the scenario. This is a film that could have easily devolved into pointless whimsy and sub-Andersonian dramatics but manages to effortlessly balance the lighter and darker aspects with a particularly deft hand. While writer/director Davis deserves no end of credit here (the script, for one, is exceptional), especially considering his first time status, Manson Family Vacation is an acting showcase, first and foremost: the film wouldn’t have nearly the impact without the combined power of Duplass and Phillips’ extraordinary performances. Watching Nick and Conrad feint around each other, coming cautiously closer and sniffing around before bolting back to the safety of their respective hard-set world views, is a pure and unmitigated pleasure, perhaps the greatest since Matthau and Lemmon made such a memorable odd couple on the silver screen. In other hands, either character could have become a one-dimensional cliche: hell, “uptight, married lawyer in need of cutting loose” and “hippy burnout with dreams of making an impact” are practically commedia dell’arte stand-bys in the modern cinematic world. Duplass and Phillips don’t stop with the short description, however, imbuing their performances with enough nuance and shading to make them seem like real people, not production notes in the margin of a film pitch. There’s an authenticity to their interactions that’s not only refreshing but infinitely more interesting than the usual cookie-cutter treatment of the same: while the relationship (and film) hit plenty of the expected beats, it does so organically rather than as carefully delineated points on a plot breakdown. When Nick rips the phone from Conrad’s hand during his welcome party with “the Family” and ruins his “reunion” with his father, the combined sense of jealously, pain, anger and the terrible need to lash out against someone, anyone, bursts out of the screen like heat from a blast furnace. Ditto the incredible, subtle moment where Conrad finally gets to witness his tireless devotion to Charles Manson from the inside and doesn’t seem to like it one little bit. They’re the kinds of scenes that would be standouts in any film but, here, they have plenty of good company. Ultimately, what J. Davis and his exceptional cast (including the single most restrained performance by Tobin Bell since his delightful surprise appearance in the U.S. version of Wilfred) have done is created a cinematic Trojan horse: Manson Family Vacation’s goofy, lighthearted and slightly silly exterior hides a surprisingly powerful, deep and thought-provoking interior. While the comedic material is constantly fun and frequently laugh-out-loud funny (Conrad’s description of his travel memoir as “On the Road: Part 2” is a real gem), the dramatic material has real bite to it. As Nick and Conrad lay their relationship out bare, rehash childhood wrongs and debate what it actually means to be someone’s “brother,” as Conrad comes closer to the father that he never knew and as Nick finally realizes the responsibility that he bears regarding his relationship with his own son, Manson Family Vacation manages to do something quite difficult and equally wonderful: it makes you absentmindedly wipe away the tear that’s traveled down your cheek, even as you guffaw at the next ridiculous situation. J. Davis’ Manson Family Vacation has real heart and I’ll take that any old day of the week. When, exactly, did the Summer of Love go up in flames? Conventional wisdom usually points to Altamont, in December 1969, as the point where the promise of free love and hippy Utopianism soured. For my money, though, I always pinpointed Sharon Tate’s murder, on August 9th of the same year, as the real tipping point. Even though the Woodstock festival (usually seen as the pinnacle of “hippyism”) would follow Tate’s murder by less than a week, I always viewed that as sneaking one last one in before Manson and his followers nailed down the coffin lid. By the time the Mason family had cemented their terrible legacy, it was pretty apparent that the shiny red apple of peace, love and harmony contained more than its fair share of rot. While Altamont may have slammed the door shut, it had begun to close long before then. In fact, some folks could see the end way before then: when Dennis Hopper’s now-iconic Easy Rider was first released, in May 1969, who could know that the man would seem like Nostradamus a mere seven months later? Easy Rider is many things: a buddy film…a road movie…a counter-culture landmark…a return to the sensibilities of On the Road at a time when that attitude seemed not only passe but quaint…a drug movie…a critique of the fractured America of the ’60s…More than anything, however, Easy Rider serves as a death knell, a dire warning from one of the original “freak-flag-flyers” that times were changing and that the peace-and-love hippies were about to be swept from the Earth in the same way that the dinosaurs once were. You could stay the same, he posited, but you would die: that was a given. You could, of course, leave behind your ideals and survive by evolving into something else entirely, something colder, more calculating, less romantic. But isn’t this, in the end, the same sort of death as offered in the first option? Above all else, however, Hopper was making concrete the words of Bob Dylan, albeit casting them in a much darker light than Dylan originally intended: the times, indeed, were a changin’. 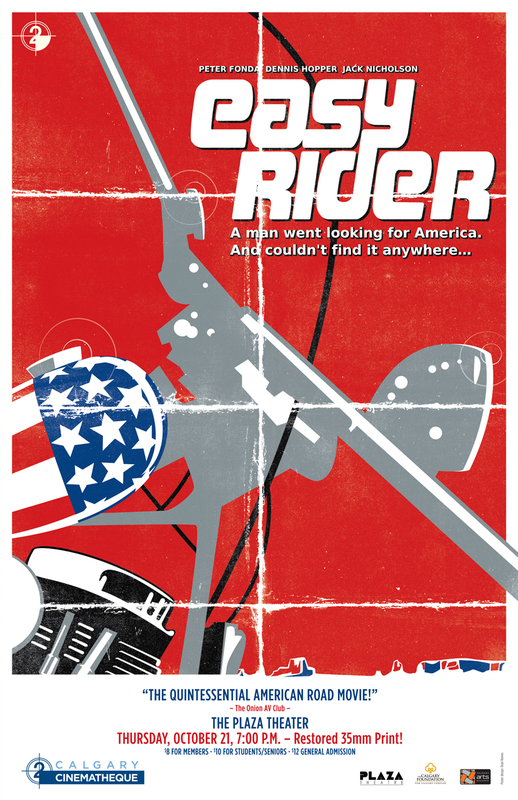 As a film, Easy Rider has a pretty simple structure: it’s essentially a series of vignettes featuring Billy (Dennis Hopper) and Wyatt (Peter Fonda), usually addressed as “Captain America.” As the two men travel around the back-roads of America, they meet with an odd assortment of characters, including a hitchhiker (Luke Askew) and his hippy commune, a drunken lawyer (Jack Nicholson), lots of rednecks and some good, old-fashioned, middle-American squares. They sell cocaine to Phil Spector (not the “person” of Phil Spector but the actual man: he’s billed as “The Connection” and wears one seriously yellow suit, complete with matching gloves and glasses), visit a whorehouse in New Orleans and leave a diner one step ahead of an angry mob of rednecks and small-town cops. For the most parts, events in the film fall into a pretty basic formula: the duo rides to a new place, Billy acts like a square, the Captain tells him to chill out, there’s a musical interlude and the whole thing repeats. Each interlude, however, serves as a way for Hopper (who also wrote the screenplay, with Fonda) to dig a little deeper into the whole notion of the “American Dream.” The opening pre-credits drug-dealing sequence begins with Steppenwolf’s version of “The Pusher,” before their iconic “Born to Be Wild” slams us right into the credits. It’s a subtle way to establish Billy and the Captain’s manifesto (they do whatever they want, man), while also commenting on changes in the pop culture zeitgeist: “The Pusher” was written by Hoyt Axton, a popular folk singer in the early ’60s but it was Steppenwolf’s cover, not the original, that Hopper used. As one of the “heavier” new bands to emerge in the late ’60s, Steppenwolf was a good representation of the direction music was taking, at the time, away from the folk and early rock of the ’60s and into the hard rock and metal of the ’70s. Steppenwolf was pushing Axton out, just as the darker mid-late ’60s was crowding out the peace and optimism of the earlier part of the decade. They end up on the hitchhiker’s commune but don’t get to stay long: the hippies end up picking on and ostracizing Billy, leading us to the notion that maybe these “peaceniks” aren’t quite as nice as they first seem. Although he couldn’t have known it at the time, Hopper was prophesying what would happen with the Manson family: the hippy exterior concealed a dangerous, deranged interior. Lest it be thought that Hopper is unduly picking on the counterculture (which is rather absurd, since he’s been a genuine, card-carrying member of the counterculture for his entire life/career), we also get scenes like the ones where Billy and the Captain get arrested for “parading without a permit” in a small town and are, essentially, chased out of a diner by a group of locals (including the sheriff) that are a few pitchforks away from the mob in Frankenstein. If the counterculture isn’t necessarily who they say they are, then the average middle-American “square” is exactly what they seem to be: small-minded, suspicious, frightened and utterly resentful of the “freedom” that Billy and the Captain represent. That these small-town folk and rednecks will, ultimately, end up being the undoing of Billy, the Captain and George (Nicholson) is certainly telling: although the counterculture has begun to collapse from the inside, its greatest threat still comes from the outside – the world at large. All of these events eventually culminate in a truly apocalyptic ending for Billy and the Captain (and poor George, of course), although it’s a finale that would probably only provoke a shrug from the kinds of people who helped perpetrate it: those long-haired, weird bastards got what was coming to them. While the finale few moments of Easy Rider holds the answer to Billy and the Captain’s fates, it’s a moment just before that actually spells everything out for an entire generation. After finally achieving their “goal” of visiting New Orleans for Mardi Gras and surviving everything that came before, Billy is absolutely triumphant: they’re both “rich” now, thanks to the opening drug deal and have finally “made it.” “That’s what you do, man,” he tells the Captain, “you go for the big money.” The Captain’s response, however, takes the wind out of not only Billy’s sails but our own, as well: “We blew it, man.” By compromising their principles and losing sight of the “big picture” (changing the world for the better), Billy and the Captain (along with the entire “Free Love” movement) have truly “blown it.” The true extent wouldn’t be felt for some time, of course, but the writing was on the wall: whatever moment might have existed was now past and the movement would continue to spin out into irrelevance. As a pivotal moment in the history of the counterculture, Easy Rider, much like Kerouac’s On the Road, cannot be easily discounted. Although certain elements have, by necessity, become dated, the overall themes and angles of the film hold up surprisingly well. As a film, Easy Rider is quite good, with sterling performances from Hopper, Fonda and Nicholson, along with some excellent cinematography that is reminiscent of the same year’s Butch Cassidy and the Sundance Kid. It’s always a hoot to see Hopper play the “straight” guy, particularly with the decades of crazy characters that would come after this. Nicholson, in particular, is excellent, providing yet another example of why he became one of the most beloved actors of all time. There’s a sense of playfulness that easily recalls Depp’s work in Fear and Loathing in Las Vegas, although Nicholson owned this type of role for some time before Depp wandered down Jump Street. If there can be any complaints, it would have to be that the film definitely becomes formulaic well before the ending, although the final 15 minutes are still some of the most powerful film moments ever. Even though the film seems a bit dated now (the commune scene, in particular, is of its era, complete with a truly bizarre mime performance and some really hippy-dippy philosophizing), it’s held up much better than similar films of the era, such as Fonda’s ultra-silly The Trip from a few years earlier. In the end, Easy Rider exists as both a fascinating curio of a forgotten era and a timely reminder that we must be ever vigilant, if we hope to truly change the world. As Sisyphus knew, the moment you quit pushing forward and forging new ground is the moment where the boulder begins to slide back down the hill. In the ’60s, the hippies managed to push the rock quite a ways up the hill. The tragedy, of course, is that it crushed them all on the way back down.